This premier dive destination in Thailand is a relatively small island with splendid beaches and intimate coves one hour for Samui or Koh Phangan. 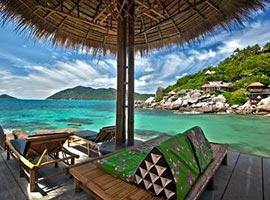 To capitalize on what nature already offers we present the best hotels in Koh Tao dotting its exotic shores. 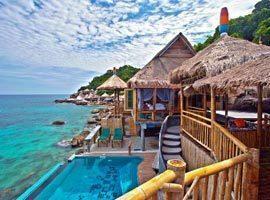 These will maximize your accommodation experience with seductive views from charming beachfront huts and bungalows. Moreover, comparing our hotel prices you will quickly realize you have arrived at the right place for the best deals.. While it is undoubtedly the number one option for obtaining a PADI dive ticket with reputable scuba schools and for seasoned divers to embark on daily excursions to famous dive sites, it is also the perfect place to escape anything familiar, kick back under a palm tree and soak the sun unhindered. Besides, you do not have to be a scuba diver to swim among colorful reef fish and coral. Simply take your snorkel, hop down to Mango Bay or Jansom Bay and swim 10 meters out to where amazing scenery unfold. 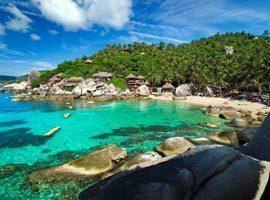 Hotels in Sairee Beach where a village features moderate nightlife is the most popular in Koh Tao, especially with those who enjoy a lively atmosphere. The area subsequently features the highest concentration of beachfront resorts and lots of budget accommodation. In the evenings BBQ's are prepared along the waterfront or you could chill out to cool tunes at a seaside bar. South of here within a 10 minutes are quieter locations such as Jamson Bay where bungalows huddle just above the waterline. Charm Churee is located in Jamsom Bay, an intimate cove dotted with coco palms near Sairee Beach, but far enough to feel secluded. Featuring 2 bedroom bungalows it is one of the best resorts for groups or families on a budget . This hideaway is an extension of Haadtien Beach Resort you see to your right, but located higher up on the hill surrounded by lush jungle. Its rooms feature hand crafted wooden furniture and all allow views of the ocean from private balconies. 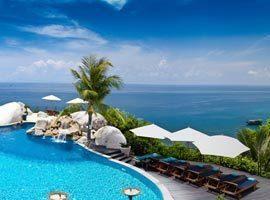 Located in a tranquil bay with a private beach, Haadtien is a boutique resort on the south coast. Luxury free standing wooden villas, some with private pools are spread among lush jungle revealing ocean panoramas from outdoor terraces. Offering 5 star accommodation Jamahkiri is the top hotel on the island nestling in tranquil Tian Og Bay. It features a private PADI registered dive club, all rooms with ocean views from private balconies and a 2 bedroom family suite. With a jungle backdrop, a private beach and its own scuba centre, Koh Tao Bamboo Huts settles across smooth boulders directly above the waterline. Its cottages and private pool villas feature outdoor decks with spectacular ocean views. 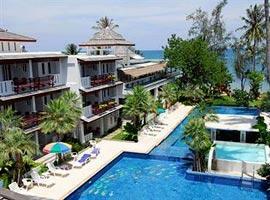 This budget hotel in Sairee Beach feature in the most secluded part of the most vibrant area. Its back to nature themed accommodation include a 2 bedroom cottage and romantic honeymoon villa both with a private pool and spectacular views. 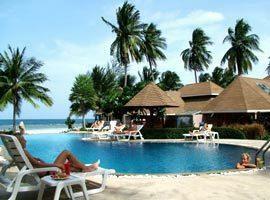 This popular resort featuring its own scuba centre is located on Sairee Beach and within moments of the vibrant town. Its Sailor Cottages are set within manicured gardens, Pirate Cottages are on the beach and The Captain Suite feature 2 bedrooms. Set on Mae Haad Beach close to the pier this dive resort operates a 5 star PADI registered scuba diving and training centre. 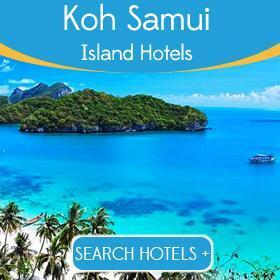 It offers deluxe rooms in a low rise building, the 2 bedroom Khun Paen Family Suite and a seaside pool villa. 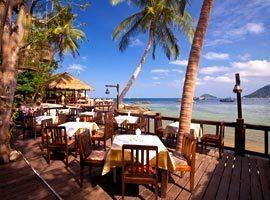 Located on Mae Haad Sensi Paradise is walking distance from shops and restaurants. With romantic sea view villas and beachfront accommodation in family bungalows and houses featuring 2 connecting rooms it caters for all occasions.